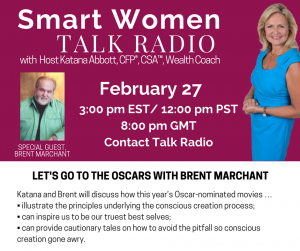 Don’t miss today’s edition of Smart Women Talk Radio with host Katana Abbott and yours truly. We’ll discuss this year’s Oscar-nominated films and the role that conscious creation plays in making them great viewing. Tune in at 3 pm ET by clicking here. Or catch the archived podcast later for on-demand listening.